Height / Weight: 6’1” / 163 lbs. Biography: A young man possessing accelerated regeneration and the ability to both shape his bones and pull them from his body; Scrimshaw’s bones can be used defensively, as weapons, as projectiles or perform a number of tasks. NEW VINDICATORS: Sic Semper Tyrannis – Such talents were enough to cause Phobos to draft him to his team during the 2007 Trials, along with Amok and Contagion. Along with Occultus Unus, Paragon and Deus ex-Machina, Scrimshaw assaulted the New Vindicators Academy of America and acted as a distraction for Terahertz. Of their group only Deus ex-Machina and Scrimshaw were captured, with Scrimshaw being defeated by Cheynne Ford and Roland Birkmeyer’s combined abilities. Michuru81 wrote: I like using Scrimshaw but he doesn't have the stuff to actually be his own villain. He works best in a group or under the command of someone who actually knows what they're doing. Scrimshaw's a decent fighter... and he doesn't try to be anything else. Height / Weight: 6’ / 180 lbs. That darkness was Eclipse, an organization devoted to holding the sun ransom. At their helm was Event Horizon, a man who through the marriage of science and mysticism had become a living black hole that slowly began to devour light. At his side was his most trusted right-hand man, the darkness-wielding swordsman known simply as the Shadow. The newly assembled Vindicators were able to triumph over Event Horizon; the combined powers of the Aurelius and the young girl codenamed Halogen abolished the madman into nothingness. They believed their act had caused the end of Eclipse but all they had done was create a power vacuum that the Shadow quickly quelled. Now the leader of Eclipse, the Shadow devoted his energy and resources to scheming against the world’s government. Ultimately the Vindicators defeated him and contained him in a prison where he was perpetually encased in an orb of light and all his furnishings were transparent to nullify the chance that he could generate a shadow. Following Chimera’s flight from Eleanor Roosevelt High School, Abaddon asked his son, the Shadow, to pose as the principal of the school for then-unknown reasons. It is now assumed it was likely to keep an eye on Magnus Loder, one of the few individuals capable of raising Atlantis from the ocean floor. During the White War the Shadow took the katana Sanada Yukimura gave to Deimos and used it to end the existence of Samael and fulfill the samurai’s prophecy concerning the weapon slaying one of the Fallen. NEW VINDICATORS: Absit Omen – The Shadow stayed by his father’s side; of Abaddon’s children only Apocatastasis ranked above him in the demon’s affection. He lovingly helped to assemble all the players needed in the ancient Nephilim’s revival and watched as the favorite son incapacitated their father upon his return. NEW VINDICATORS: Para Bellum – He remained by Apocatastasis’ side throughout the Nephilim’s campaign, though it is assumed he did this to stay near Abaddon’s hollow husk. Upon the realization that Apocatastasis could heal fractured minds by mimicking Emmanuel Nikolaos’ Neo-Sapien powers the Shadow freed the healer in hopes that he could restore what Apocatastasis had robbed Abaddon of. Whether or not he was successful has yet to be seen. NEW VINDICATORS: Et Spe – The Shadow returned to Apocatastasis’ side mysteriously and encountered the Aurelius (Doctor Stephen White) first. The two old enemies clashed and, ultimately, it was the Shadow who triumphed. Before he could deal the finishing blow however, one of the Aurelius’ pupils (Fey) erupted into the tower of darkness and began to continue her master’s battle. She two was bested and, once more, before he could execute his fallen opponents, a newcomer entered the fray. William Benson, armed with Mjolnir, joined the battle; Falkenburg also came to the Aurelius’ defense. As both men were accomplished swordsmen at the Shadow’s level a battle of blades began. Last edited by Michuru81 on Mon Sep 01, 2008 8:34 am, edited 1 time in total. Height / Weight: 5’6” / 144 lbs. Biography: Little is known of Taria Reynold’s life prior to her being recruited into the Bisons. As Deimos’ powers were similar to her own, the two were quickly drawn toward each other and a passion-filled romance began. Ultimately, when the two made a move to leave the group Deimos believed Enyo killed in Bogart’s bid for power and allowed the group to believe him dead in an explosion unknowingly set by Enyo. NEW VINDICATORS: Memento Mori – Enyo was amongst the group who attacked Italo Huang’s, the restaurant where Lodestone was meeting Loess’ family. When Deimos and Enyo saw each other, old memories were stirred for him and Enyo revealed that she had been the one who had tried to murder him, not Bogart. Spoilers wrote: NEW VINDICATORS: Et Spe – Enyo fought Deimos again, this time inside the conquered New York City. Though Deimos had threatened to end her life the next time the two met, he refused to kill her, opting to incapacitate and abandon her. Wow, The Shadow is a beast at swordplay. I always wondered when he fought why didnt he just blast the hell out of people with hellfire, this way he wouldnt have to worry about getting hit. Blast, Shadow Jump, Concealment, Rinse and Repeat (always reapeat!). Im guessing he has a super-ego when is comes to swordfight? NateDogg5257 wrote: Wow, The Shadow is a beast at swordplay. I always wondered when he fought why didnt he just blast the hell out of people with hellfire, this way he wouldnt have to worry about getting hit. Blast, Shadow Jump, Concealment, Rinse and Repeat (always reapeat!). Im guessing he has a super-ego when is comes to swordfight? Michuru81 wrote: I have a confession to make: I watch Days of Our Lives. I have ever since I was ten-years-old. It’s how I spend my lunch hour at work. It… it’s my deepest, darkest secret. It’s my guilty pleasure. It’s my vice. It’s also not too far removed from what most of us read: comic books. Granted, the characters don’t possess super-human powers (unless you’re watching Guiding Light) but the two mediums have a lot of similarities; for starters: they both have incredibly farfetched scenarios. For instance, right now on Days of Our Lives, John Black’s mind has been erased and backed up on a CD; he now has the personality of a cold-hearted criminal mastermind. All of this was engineered by his half-brother/arch-nemesis who has died and come back from the dead numerous times. How is that not a plot at home in a comic book? 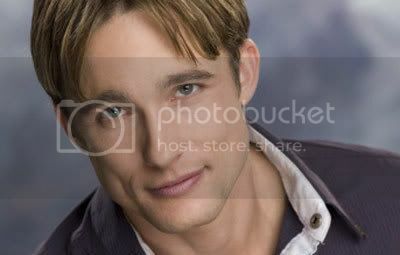 Now, I’m going to go out on a limb and suggest that I’m the first person on the boards to actually stat a character from a soap opera (and if I’m not… wow… someone else has a little of a life as I do…) and I’ve opted to kick things off with Philip Kiriakis. In Salem, the Kiriakis family are of Greek ancestry and are responsible for a lot of the bad stuff that goes down on the show. Philip’s dad has had his hands in drug deals, prostitution rings, and full-blown mafia business. Apparently Philip has stepped into his father’s shoes here and has assumed the role of Salem’s crime lord – though he didn’t start out here. Initially Philip started out as a secret agent, working for ISA (International Security Agency), a group which (ironically) had once investigated Titan Industries (which Philip is currently the CEO of). Working with TEK, Philip worked to uncover Tony DiMera’s underhanded dealings. Philip changed gears, becoming a Marine who was soon called to active duty in Iraq. Despite returning home sans one leg he still manages to get around pretty good. Since then he’s learned that his daughter is not really his, but rather the daughter of his best friend (who is his nephew whom he stole his wife from and then tried to have assassinated). Height / Weight: 5’7” / 153 lbs. Biography: When his Neo-Sapien ability to exhume bleach from his skin first manifested, Andrew Woodford was viewed as a threat and subdued by a mob of angry citizens, thrown into the drunk tank at the sheriff’s station and left to wait for a representative of the Church of Genetic Purity to arrive and claim him. Fortunately for Andrew, fresh recruits from the New Vindicators Academy arrived first and moved to rescue him and help him escape to New York City. Last edited by Michuru81 on Sat Oct 04, 2008 9:02 am, edited 1 time in total. Height / Weight: 6’2” / 169 lbs. Biography: At the age of five, Job’s village came under attack by the Lord’s Resistance Army. The youth’s memories of the night he fled the massacre are fuzzy but he knows he traversed two nations before finally finding shelter in a refugee camp. As one of the Lost Boys of Sudan, displaced by the Second Sudanese Civil War, Job was taken to America and soon found Omaha, Nebraska as his adoptive home. At least it was until his abilities as an Esper manifested. While Omaha was considered to be extremely volatile, due to the diversity across the city’s racial spectrum, Job found little peace given his skin color. After he displayed an ability to move objects with his mind… he was even more unwelcome. Job has since been taken in by the New Vindicators Academy, making him a refugee from even the city that took him as a refugee. Still, he claims he has no intentions of staying at the school long. He yearns to become a doctor and join Medecins Sans Frontieres, hoping to return to his homeland and try to put right all that was made wrong. Height / Weight: 5’6” / 153 lbs. Biography: John Titus grew up idolizing his older cousin, Peter. Even when Peter inherited his father’s aquatic talents, “Little John” couldn’t help but stand in awe of the amazing abilities at the young man’s disposal. Peter joined the New Vindicators Academy of America and during the school’s breaks he would return home, showing his little cousin the uniform he wore and telling him his codename: Tide. John didn’t believe he could have been prouder but then Peter was accepted to medical school. John’s pride swelled again and he couldn’t help but imagine where Peter’s life would take him next. And then he sat spellbound by the news on the television: Chienne Bedford had been kidnapped and Tide was responsible. John was disgraced by his idol and fought to distance himself from his cousin. After the White War, Tide appeared at his cousin’s house, hoping the young boy would help him escape. John tried to drive Tide away but Peter was persistent. In the end, John was forced to manifest his own hydrokinetic abilities and use them to force Tide away from him. Not wanting to be associated with Tide, John tried to hide his powers but ultimately they were eventually exposed and the Titus family once again called on the New Vindicators Academy to train one of their young sons. Height / Weight: 5’0” / 113 lbs. Biography: Yoshimi’s maternal grandfather, Touya, was a member of the 442 Infantry, a legendary regiment of Asian American soldiers who fought during the Second World War. He was, and still is, the bravest man the girl knows and is the only connection to her family she still has. When Yoshimi was seven, her parents celebrated their anniversary by taking a cruise on a boat borrowed from Tim Coyne’s friend. A storm rose up and strong winds blew the boat off course. Tim and Sachiko Coyne were never seen from again. To help combat his orphaned granddaughter’s grief, Touya Katahira began to teach the girl karate. Employing the martial arts as an outlet, Yoshimi quickly rose through the ranks and was a black belt before she entered junior high. It was then that Touya learned that an old friend, Tsui Tse, had grown sick. Together, grandfather and granddaughter left America for China, to tend to the man in his final days. It was there that Yoshimi became Tsui Tse’s final student. The man began to teach her qigong, the art of chi manipulation. As she delved into the mystic art she also learned of her own Neo-Sapien ability to defy gravity. Such ability made her a dangerous opponent… but Yoshimi, perpetually a hard worker, was not yet satisfied with herself. She took it upon herself to master kung fu and began training with associates of Tsui Tse, met at the man’s funeral. The man’s other disciples were amazed with the girl’s abilities and were reminded of their favorite wuxia heroes – martial artists who appeared to fly in their favorite films. Years passed before Yoshimi was able to claim mastery over the martial art and with her grandfather, the pair returned to America… but not to Hawaii. Having learned of the New Vindicators Academy of America, the two journeyed to New York City. Yoshimi enrolled and Touya relocated, in order to remain close to his only remaining family. Believing the school to be a stepping stone to the Vindicators and her true calling, Yoshimi is anxious to prove herself. Height / Weight: 5’3” / 129 lbs. Biography: Orphaned at a young age, Candace grew up in an orphanage. The summer before her junior year she was suddenly adopted by a couple, Mister and Missus Strauss, who relocated their new family to Peoria, Illinois. NEW VINDICATORS: Hostis Humani Generis - As she entered Central High School, Candace became aware of her abilities: no one near her could tell a lie. At first she incorrectly assumed she was a Neo-Sapien, but one of her classmates, David Kennel, set her straight by explaining that she was, in all likelihood, an Esper. NEW VINDICATORS: Condemnant Quod Non Intellegunt – As the new school year started, Candace became romantically involved with a new student, Carl Hamilton. Last edited by Michuru81 on Tue Jul 14, 2009 8:48 pm, edited 1 time in total. Height / Weight: 5’6” / 120 lbs. NEW VINDICATORS: Hostis Humani Generis—Eventually the New Vindicators discovered that the Fuhrer, the reason the Vindicators had first banded together, was still alive and that he extended his control over the parents of Espers, coercing them to relocate and place the potential new recruits for the Sixth Reich in one location. Of course the Fuhrer did not count on one of the Espers having an ability that made her immune to all of his. Laura’s Esper ability made her immune to the abilities of other Espers (as well as some Nephilim and Neo-Sapien powers), and extends to those nearby. Along with the New Vindicators and the Affiliation, Laura was able to destroy the Fuhrer’s hold on many of the students and drive the Sixth Reich to retreat. Ultimately, Laura opted to leave the area with Prompt, going off in search of the remnant of the New Vindicators Academy of America. NEW VINDICATORS: contraria contrariis curantur—When Lodestone moved to seek out the Affiliation, Laura suited up to go on her first mission. When Chienne attacked their jet, however, Laura found herself taken by Coldfire as he left the plane and was soon screaming as the pair ended up in a free fall. Coldfire was able to save them both but Laura was clearly unnerved. Still, the Vindicator pushed on and took her with him to face Adonis, needing her immunity if he was going to successfully execute the Affiliation's leader. Last edited by Michuru81 on Sun May 23, 2010 2:08 pm, edited 1 time in total. Height / Weight: 5’8” / 148 lbs. Biography: Since he was a small child, Cale Ueshiba has been aware of his Esper abilities: when Cale enters the R.E.M. cycle his mind displays before him all that he will experience over the course of the next day. Cale is incapable of experiencing dreams or nightmares, he only dreams of the near future. NEW VINDICATORS: Hostis Humani Generis – As his new life began at Central High School, Cale found his visions disrupted for the first time. For as long as he could remember he had seen the coming day exactly as it would transpire. Everything changed the day he met John Smith, the man who seemed to defy destiny. For weeks, Cale watched as his precognitive dreams were proven wrong whenever John Smith was involved. Such a curiosity caused Cale to confront him, outing himself as an Esper and causing John to reveal his Neo-Sapien ability to manipulate the likely and the unlikely. He also went on to reveal that he was a student of the New Vindicators Academy, codenamed Fluke. A strange friendship formed between the two. The more time he spent around Fluke, the more uncertain the future became – it was an experience Cale savored. Ultimately, the student body was attacked and the Fuhrer took control of the numerous Espers he had steered into one location, Cale amongst them. Following the battle, Cale opted to join Prompt in seeking out the New Vindicators Academy. NEW VINDICATORS: Condemnant Quod Non Intellegunt – Cale Ueshiba joined the New Vindicators Academy of America for his last year of high school and, following the decision to train the students as New Vindicators, was drafted onto Magnus Loder’s team of trainees, codenamed Déjà Vu. Last edited by Michuru81 on Sun May 23, 2010 2:10 pm, edited 2 times in total. Keep up the good work, Oh forgotten one. Biography: Little is known about the man who calls himself “Bang-Bang” Jones save what his Interpol file says… he’s a sharpshooter from England currently employed as an assassin for Crimson Shadow – an elite syndicate of assassins who specialize in Super-Powered Beings.